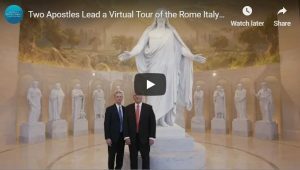 In an unprecedented video, Elder Bednar and Elder Rasband give a walk-through tour of various rooms in the Rome Italy Temple, explaining what happens in each room. In the video below, President Russell M. Nelson provides an introduction to temples, and two apostles, Elder David A. Bednar and Elder Ronald A. Rasband, show and discuss various rooms, which mirror what is found in all Latter-day Saint temples around the world. These include the baptistry, instruction rooms, the bride’s room, marriage sealing rooms, and the celestial room. The Rome Italy Temple of The Church of Jesus Christ of Latter-day Saints will be dedicated in several sessions from Sunday, March 10 through Tuesday, March 12, 2019. Learn more about the Rome Italy Temple.